Military chaplain candidate Jacob Snell preaches to his classmates - the first LDS chaplains to be trained entirely at BYU. 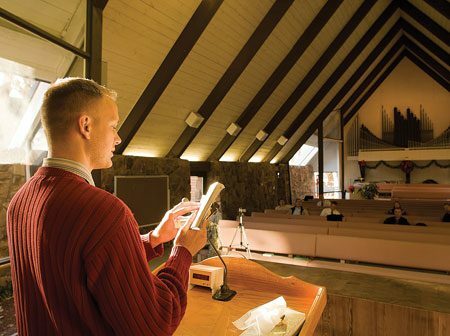 In Sunday best, Jacob R. Snell (’10) grips the pulpit, ready to address the small congregation seated in the pink-upholstered pews of the Utah State Hospital chapel. Below him, BYU religion professor Roger Keller adjusts the video camera, then gives the cue to begin. Military chaplain candidate Jacob Snell preaches to his classmates – the first LDS chaplains to be trained entirely at BYU. “Let us read the word,” Snell calls out, citing verses in Amos chapter 5, and the audience rises to their feet. Snell’s oration lasts 10 minutes, filled with powerful hand motions, voice inflexion, and scripture. At the end, his audience—the first students to pursue BYU’s new master’s in religious education for military chaplains—picks his sermon apart. They are learning to deliver nondenominational sermons: as future chaplains they will be the religious presence on a military base, charged with providing or finding religious services for everyone—Protestant, Catholic, Muslim, or Jew. At present there are 63 LDS chaplains on duty throughout the world who provide these services. And the seven students meeting here in the Utah State Hospital chapel will soon join them as the first LDS military chaplains to be trained entirely at BYU. After years of working with CES, the Church Military Relations Department has finally achieved a place for chaplains at BYU: chaplain candidates can now apply alongside CES students for the 15–17 slots available in BYU’s one graduate religion program. The first seven chaplain students were accepted last summer. An additional 15 credits of religion were created solely for BYU’s student chaplain candidates, classes including Military Ministry and two semesters of advanced world religions. They are taught by Keller, who served as a Russian linguist for U.S. Army Intelligence, as a chaplain at a Presbyterian college, and as a Presbyterian minister before joining the Church and teaching at BYU.